After your leads sign up for a My Listing Manager account, IDX Broker will send them a verification email. Inside that email, there will be a link that the lead needs to click on to verify their email address. You can customize this auto-responder email by clicking Leads in the main menu, and Lead Registration Preferences in the submenu. Make sure the toggle switch in the upper left corner of the screen is set to Advanced, and then click the <strong">Email Verification tab. 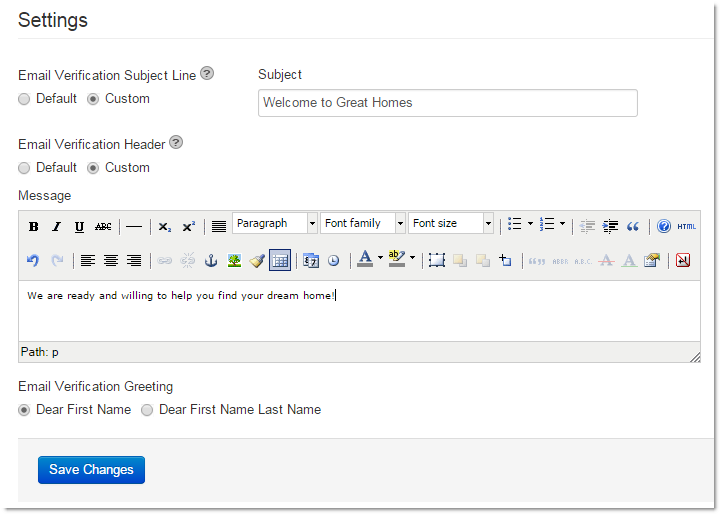 Here, you can customize the subject line of the verification email and also the header message. The header message displays at the beginning of the email, above the verification link the lead will need to click on. To customize either of these messages, click the radio buttons over to Custom, and use the text boxes to the right to enter in your custom content for each. When you are done, click Save Changes at the bottom of the screen. account, IDX Broker will send them a verification email. Inside that email, there will be a link that the lead needs to click on to verify their email address. You can customize this auto-responder email by clicking Leads in the main menu, and Lead Registration Preferences in the submenu.